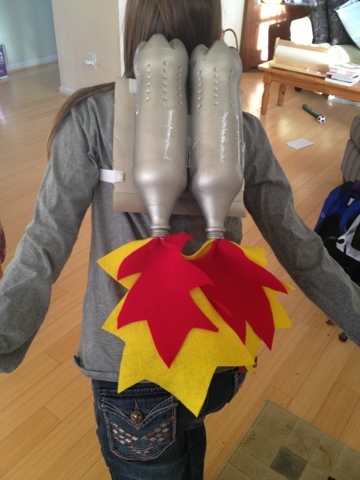 Cottage on Blackbird Lane: Turbo Jet Pack! Never do I know what to get kids for their birthday. It's so hard to choose something great. Then if you factor in the fact I have no boys it makes for a more difficult choice. Usually my fall back gift options are books. Except that when the gift is for a boy who has a mom that is a phenomenal book lover well that just puts me back to the beginning. My girls were not much help. Finally after a good brain storming we girls figured out what would be the thing for dear Sam. Since we couldn't find anything great we decided to make something great. What would a 5 year old boy want? 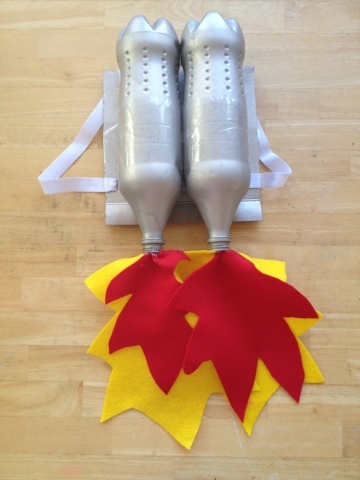 We determined that every 5 year old boy needs a jet pack. So why not make him one? And that's what we, er, I did. After consulting various websites I concluded that there are some creative people out there with plenty of time on their hands to make exciting things. I am ever so thankful for those folks. I couldn't find one particular design that I liked best. 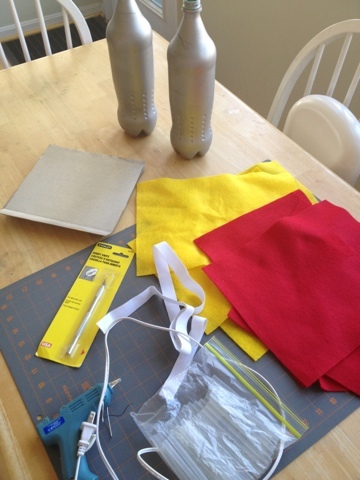 I looked at the general idea and took note of the materials lists to see where I could go with my own crafty stash. The main important feature of all designs were the 2 liter bottles. Some even used old oatmeal canisters. I had none of those things laying around. Not big plain oatmeal eaters or 2 liter soda drinkers we needed to get the turbo part of the turbo pack. We went to the store and picked up some soda bottles and the spray paint. Everything else I was able to find at home. 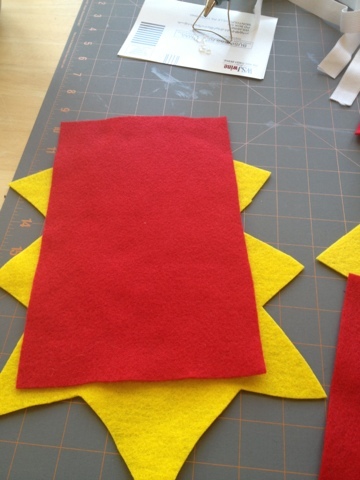 This project is pretty easy to complete. The painting requires a few days for drying but otherwise it can be put together in under an hour. We chose the smaller bottles for two reasons: this is meant for a littler kid and we could not drink 4 liters of soda in 2 days. Using 2-liter or 1-liter bottles will work equally as well. 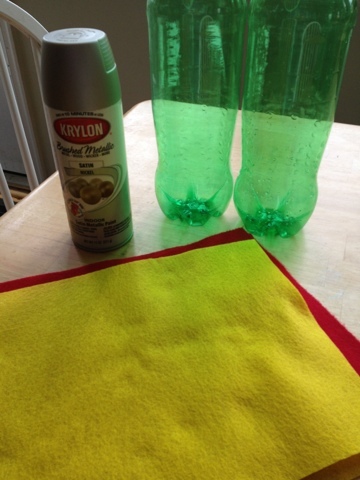 The spray paint, felt, and 1 liter bottles. The first step is to paint the plastic bottles. I decided to spray paint the piece of cardboard the pack is glued to the same silver color. The spray paint we used to paint the 1 liter bottles. Anything similar will work. I settled on this brand because that's what the store had in stock. Before spray painting the bottles I checked our recycle bin for some cardboard. I used a medium weight cardboard from a box of fruit snacks I bought at one of those bulk stores. I measured it out to fit my bottles. I allowed for a full day to spray paint the bottles and cardboard. I suggest that if you can to allow the bottles to dry upside down. 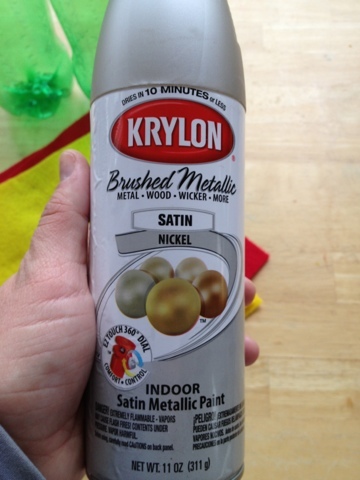 The spray paint will flow quickly so use a gentle hand with the paint. To dry the bottles I stuck some wooden dowels into my garden and set the painted bottles to dry on them. My bottles and cardboard piece required 2 coats of paint and a full 24 hours to dry from the last coat. The materials all ready to be put together. 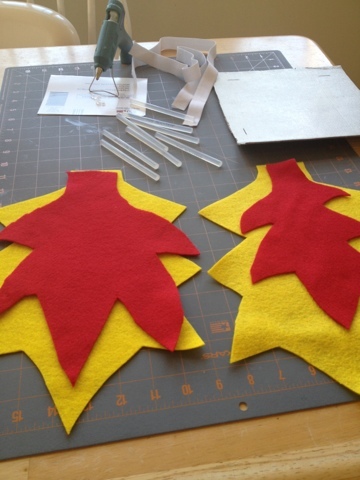 I began by cutting out my felt flames for the bottles. I didn't use a pattern using my Sharpie I drew what would look like some awesome flames. As you can see they turned out different which is just fine. Don't worry about the flames being identical, no two flames are the same. 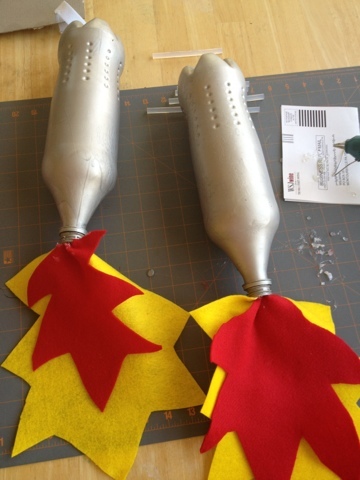 The differences won't matter because once you glue the felt flames to the bottle they will look very cool. Attaching the woven elastic band to the cardboard took a few steps. I decided to use elastic to allow for easier wearing. 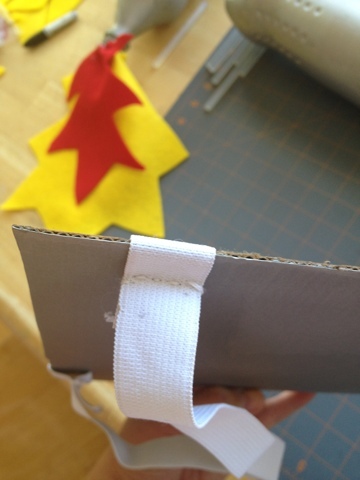 Elastic is great for many reasons but if you do not have some you could use some webbing straps or a sturdy ribbon. 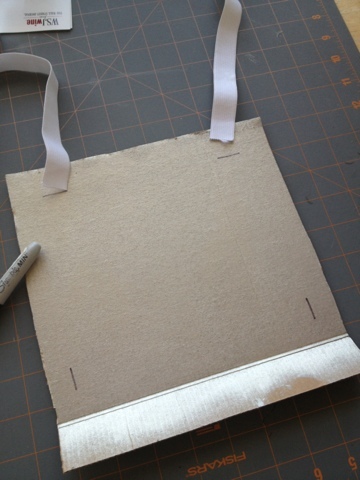 I drew 4 lines on the cardboard in the general location of where I wanted the straps to be attached. I used my x-acto knife to cut slits through the cardboard. I used a pencil to stuff the woven elastic through the slits. I adjusted the straps to make a good fit. You could staple the straps, that is a good option if you use webbing. 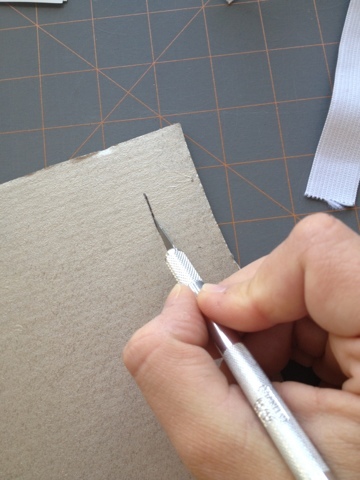 Staples will not work as well as sewing if you use elastic. I chose embroidery floss because it allowed for a more sturdy seam. 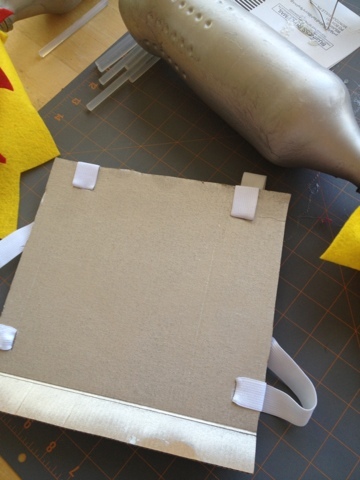 The cardboard backing is all complete and ready for the turbo pack gluing. I used a hot glue gun to glue the flames into the opening of the bottles. To prevent burning yourself I suggest using a pencil to help you stuff the hot glue covered felt into the bottle. 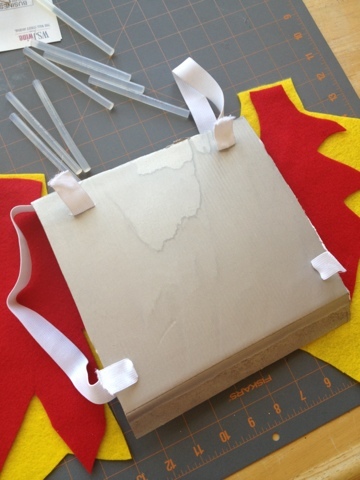 When the flames are glued and have cooled it is time to attach them to the cardboard backing. I added a little glue to the sides of the bottles to glue them together. Unfortunately that was not working as well as I anticipated. The hot glue began to melt the tiny spot where I put the glue so I chose to use packing tape instead. A good epoxy glue would have been a good option too. Affixing the bottles to the backing was far easier with the bottles being attached to one another. I squirted some hot glue to the cardboard then gently set the bottles on the backing. Once the glue dried I inspected the finished pack. Looking at it with more detail I realized that the hot glue was not going to be sufficient enough to keep this pack assembled. Especially for a little boy. Just to make sure that the bottles will stay put I used some packing tape to wrap around the bottles and cardboard. The tape is somewhat noticeable but does its job. If we had some reflective tape or awesome NASA stickers that would be a great spot to stick those. I declare this craft a success! The end product was a hit, well with my girls it was. We have to wait and see what the birthday boy thinks later tonight. I'm sure Sam will love it very much. Apparently I have to make 2 more of these for my girls. I better go warm up that glue gun. Sam wore this ALL DAY LONG. He LOVES it.